India vs England test series is turning out to be crazy when you think about numbers associated with it. After the first test, Trent Bridge turned out to be a batting paradise for the tailendars amongst all the grounds in England. Then the historic Lord’s win saw an uncanny resemblance to the last Indian win at Lord’s. As the 4th test has begun in Manchester, where the last India vs England match featured a maiden century for the great master, Sachin Tendulkar, more such revelations are in order for India. Let’s start with the Indian batting which is notoriously called flat-track bullies (mostly on the pitches inside the sub-continent) these days. Yesterday, Indian scorecard read 8-4 which is not Football score but what happened when Indian batsman could not play swing bowling from Anderson and Broad. 8-4, unfortunately was trending yesterday on Twitter. 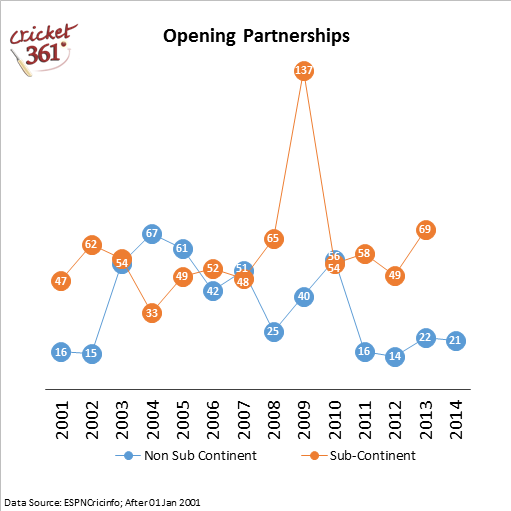 This graphic states that opening partnership (average for each year) is of great concern for India. When compared from 2001 till date, the period of 2011-14 has been the worst patch for the openers outside the sub-continent. The high for the opening partnerships was clearly the time when Sehwag used to scare the bejesus out of the bowlers with absolutely no respect whatsoever. And the decline in Sehwag’s form has not shown any recovery in the opening partnerships by any other player. It is peculiar that if you look into the 2nd, 3rd and 4th wicket partnerships, we do not see a particular trend. Now, let us start with the bowling which is considered as second fiddle to any batting line-up in India. India is known to produce quality spinners (especially off spinners) from the ancient times. But after reading the following, one might think otherwise in the recent times. Last decade or so, India has always played one-off spinner in the team irrespective wherever they are playing. Apart from a period of 4 months where Harbhajan was injured between Dec 2003 and April 2004, India has always played a frontline off spinner. As Ashwin played after sitting out for 6 tests on a trot, this period becomes the longest span (Dec 2013 – August 2014) of period without an off spinner playing in the team. To look up at the past records how India fares without any frontline off spinner, you will find that there will be a higher chance of the match being lost by India. It is well-known than R. Ashwin is not effective outside the sub-continent. But all these years before he displaced Harbahjan from the team, Bhajji maintained almost a similar average (Runs given / wickets taken) all across the wickets. This made him irreplaceable for a long time. Though it is worth a mention that both bowlers have completely different bowling styles. Bhajji is more of a loop bowler while Ashwin relies on his bag of tricks and is a bit faster in air. But if Ashwin truly wants to be India’s frontline spinner, he really needs to show by his performance in this test at Manchester and the next one given a chance. Having said enough about off spinners, I miss those times when Bhajji and Jumbo used to rip apart the batting attack in any given condition. Should Dhoni stand up and play a leg spinner up-front like the Aussies used to do (Shane Warne)? I think it might be interesting to look into all the options India has in terms of spinners. Once upon a time, Indian spinners regarded as the text-book for spin bowling have started to lose their sheen. With Karn Sharma being drafted into the squad for the limited overs version, will India’s spin Dark Knight finally rise? ashwin, bhajji, frontline spinner, india, IndvsEng, opening woes, sehwag, spin bowling, sub-continent. Bookmark.